With last weekend’s 59-14 loss to the University of South Florida, came much more than a televised walloping for the Seawolves. All the hype, carried over from a 2009-10 school year that saw the university take unprecedented leaps on the athletic fields, came to a head. The monster four-Hansen winner backfield was finally able to get to work. The players who transferred from Hofstra University, which folded its football program in December, were able to officially resume their careers. Long Island football fans were able to sink their teeth into something whole before high school games kick off this Tuesday. Stony Brook’s 14-7 lead in the first half was the gem of the game for Long Island thanks to Ed Gowins (Bellport) and Brock Jackolski (William Floyd) touchdowns. Gowins, whose touchdown was a three-yard dive run, scored after quarterback Michael Coulter, who finished the game with four interceptions, set up a 31-yard pass to receiver Jordan Gush. Jackolski’s score was a 27-yard reception. 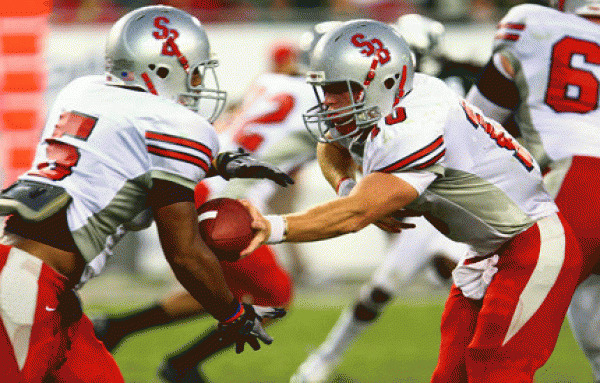 Gowins’ touchdown brought him within one touchdown of second place all-time in Stony Brook history. Playing in front of 40,000 fans at Raymond James Stadium against a Big East opponent is vastly different from the confines of Kenneth P. LaValle Stadium in Stony Brook. Athletic Director Jim Fiore has made it known that his desire to take Stony Brook to the next level is addicting. He sees a major push coming in the future to advance Stony Brook into a conference like the Big East one day. What Stony Brook has is a football team, which is more than Hofstra can say right now. They have an opportunity to win out the rest of their schedule and capture a second straight Big South Conference title. This is not their last televised game and not their last chance to perform on a grandiose stage against a team from a conference like the Big East. One loss against a team of this caliber is no loss at all for Stony Brook, which has just jumped into the limelight of the tri-state area and possibly further come season’s end.